Bill Windsor has filed a lawsuit against approximately 500 anonymous cyberstalkers. Bill Windsor is now suing all the anonymous screen names. William M. Windsor v. John Does and Jane Does seeks an injunction against the anonymous defendants that forbids them from defaming him and the people filmed for Lawless America...The Movie. Bill Windsor is also asking the Court to order that any defamatory material currently online be taken down. 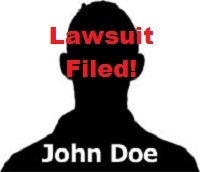 There is a recent court precedent where such a lawsuit was filed and such orders were issued. In case you haven't heard, corrupt Ellis County Texas Judge Joe Grubbs dismissed Bill Windsor's defamation lawsuit (the largest in U.S. history) against Joeyisalittlekid because William M. Windsor was unlawfully incarcerated, denied bond, and could not appear in Texas for a hearing. It was all part of a detailed scheme to get the cyberstalkers out of a potential judgment of $100 million. The lawsuit will be published here once we see what the court does with a case in which the defendants are all fake names like Ginger Snap, Dontae Givafuque, and Anita P. Ness. In other news, lots of "love letters" were sent winging their way to corrupt and dishonest people all across America. Bill Windsor returned "to the scene of the crime" today. He visited the parking lots of the AT&T Store and Federal Express in Meridian Idaho. He was not arrested, though he has no doubt that Janna Fettinger of FedEx would have called the Meridian Police again if she had seen him.